Of all of Rome's honorary citizens, Father Tiber merits a particularly special place. For centuries the river took an active part in city life, for good and ill, often destroying lives and homes with the devastating floods that periodically invaded the low-lying neighborhoods. That is why, when Rome became the capital of Italy and the whole city underwent a major makeover to make it look like a great European capital, the Tiber was enclosed in heavy embankments. The river now lives, alone and imprisoned, between the stout walls that isolate it from the city's life, and the time when it was home to boats, mills, and fishermen is long gone. In earliest antiquity, the catch was plentiful and constituted an important element of the popular diet, though fish, freshwater and saltwater alike, was considered unworthy to serve to company. Gentlemen who liked to go fishing were regarded with suspicion. Later, however, Antony and Cleopatra, as well as the emperors Augustus and, later still, Marcus Aurelius and Commodus, were passionate anglers. Contact with the refined civilization of Greece taught the Romans to appreciate the delicate flesh of fish and the masterly preparations cooks could make from it. Demand for fresh fish, especially rare varieties, reached the point that aquaculture was introduced. Some installations were veritable masterpieces of hydraulic engineering, accommodating both freshwater fish and those requiring seawater. The fourth and fifth levels of the Markets of Trajan, in the center of Rome, contained aquariums filled with freshwater and with seawater brought from Ostia, the port of Rome. The demanding gourmet could order salmon trout from the Moselle or Danube, or fish from the Black Sea, or sturgeon imported from Greece to be caught live by specialized slaves. The markets of Ancona and Ravenna supplied large quantities of pesce azzurro (see page 00), while from Sicily arrived the greatest delicacy of all: the moray eel, muraena in Latin, murena in Italian. The fashion for private fish farms exploded, and the nouveaux riches outdid themselves to see who could stock the rarest fish. The largest fish farms were built in Campania, where Licinius Murena launched the fashion in about 90 B.C., to be followed by the consul Sergius Orata, the first to raise oysters (at Baiae). He was followed in turn by such famous jet-setters as L. Licinius Lucullus, who had a hole cut through a mountain near Baiae to bring the water from the sea to his fish farm. Against these characters stood the moralists-notably Cicero-who called them disparagingly "an aristocracy of fishermen" who cared more about their fish farms than about affairs of state. In addition to the moray eel, the Romans' favorite fish included tuna (especially the belly), red mullet, gray mullet, eel, sole, and mackerel. No pike could equal those pulled from the Tiber where the sewers emptied. Large fish were much sought after and were often given as gifts to the emperor. A satire by the poet Juvenal tells of an enormous turbot given to the emperor Domitian, who supposedly consulted the Senate as to the best way to cook it. A true gourmet treat were the mollusks: oysters, date shells, mussels, clams, warty Venus, scallops, and razor clams. Particularly prized were the oysters of Lake Lucrinus, in Campania, and, later, those imported from northern Gaul. The invasions of the migrating tribes, who swarmed down from the east onto the fertile Italian plains, wiped away all memory of the gourmet life. Wars, famines, and plagues left the lands abandoned for centuries, and so they ceased to produce. The road back to civilization was long and hard. In successive waves, the so-called barbarians canceled entire inhabited and cultivated regions from the map of Italy, erasing more than merely eating habits. Medieval man had to begin again from scratch, living in houses no longer worthy of the name, nourishing himself when he could with game, wild grains, and roots. The people forgot the great Roman cuisine almost entirely. With the economic upturn of the year 1000, the waters of the Tiber once again became a major channel for the movement of people and goods, including foodstuffs. Business was conducted in the crowded ports of Ripetta and Ripa Grande, where the traffic of large and small craft grew steadily until boats and ships created frequent bottlenecks, comparable to those on today's roads and streets. While it was still active, the port of Ostia fed the major part of commercial traffic directed toward Rome, since the Tiber was navigable as far as its tributary the Nera, in Umbria. For centuries, small and large craft were pulled upriver by water buffalo treading a sheep track along the left bank. This service, called alaggio, or "haulage," was in use as early as the Roman Empire. In the Middle Ages, the monopoly was given to the bishop of Ostia, who engaged a subcontractor to supply the animals for traction. The flow of shipping in the ports and the activity of the boatmen and stevedores who loaded and unloaded all sorts of freight, including food, were regulated by papal proclamations and motu proprio, or decree. The Tiber also participated in city life by making its rich, unpolluted waters available to fishermen. The humanist Paolo Giovio (1483-1552) maintained that ninety-six varieties of fish could be caught in the Tiber, and fishing on the river was always one of the marvels of travelers. There were trout, pike, barbel, carp, eel, salmon, and sturgeon. As late as the mid-nineteenth century, sturgeon, salmon, and their caviar were sold in shops in the city and in the outlying areas. Sturgeon had given rise to a curious and ancient tradition. In the Middle Ages, the heads of the largest specimens-those longer than 47 inches (1.2 meters)-were brought as gifts to the Conservatori del Campidoglio (the political hierarchy that governed the city), for whose tables they were transformed into delicious soups. Most of the brutes were caught in the short space between Tiber Island and the Ponte Sublicio. A marble plaque spelling out the rules for sale was supposed to be displayed wherever fish were sold. An amusing example can still be seen on the Portico d'Ottavia, next to Via di Sant'Angelo in Pescheria. The text says that the head, up to the first fins, of any fish longer than the diagram had to be given to the conservatori. The diagram in question is a picture of a sturgeon incised on another marble plaque, now in the Palazzo dei Conservatori, one of the buildings of the Capitoline Museums, on the Piazza del Campidoglio. Of the many species that the then-clean waters of the Tiber used to offer, the most famous were perhaps ciriole, small, strong-tasting eels, different in both size and flavor from those fished (then and now) in the lakes of Lazio. They were cooked in guazzetto, or else fried, according to an ancient and unvarying recipe. The University of the Fishermen, as the guild to which all those who worked with fish was called, was one of the oldest and most important in the city's guild hierarchy. It included the fishermen of the upper Tiber, as well as those who fished the river's middle course and mouth. The guild was regulated by a charter: one that has come down to us dates to 1665. It is more or less from this moment that fishing, formerly a laissez-faire activity, was regulated. The fishmongers belonged to their own guild, whose charters are documented from 1536. The guild established rules and regulations for both hygiene and retail sale of fish. They could now only be sold in specific markets or in the city streets by special license from the consuls. Fishmongers also had to use a particular kind of basket, called a celigna, both to transport the fish and to measure it: according to law, the tail had to remain outside the container and could not be considered in the price (which was based on length, not weight). For reasons of hygiene, the sale of fish, in the street or in the market, was prohibited during the hottest part of the year, from July 8 through September. The main fish market, from antiquity down to the beginning of the twentieth century, was in the Portico d'Ottavia, in the Ghetto. There was a second market at the Pantheon, and another in the quarter, or rione, called Ponte. A large exhibition market of fish, the cottío, took place two days before Christmas, after midnight. The opening was marked with a solemn ceremony attended by city authorities, prelates, patricians, and members of the press, even at the beginning of the twentieth century. Three piazzas were rented by the University of Fishmongers and the proceeds were handed over to the Camera Apostolica (in other words, the Vatican), which also collected rent on the stone used as a sales counter. The fish market did not move until 1922, when it was transferred to the General Markets-the main wholesale food market-on Via Ostiense. The 1536 charter even dictated rules for correct behavior on the job: "It is prohibited to play with dice on the stones of the fish market. ... It is prohibited to throw down money for the riffa [raffles] on top of the fish ..." and so forth. Curiously, the charters authorized fishmongers to sell "wild animals," defined as "pigs, stags, goats, hares, pheasants, partridges, pigeons, doves, thrushes, starlings, and other tiny birds." The University of Fishmongers, like all the other guilds of the city, ran a home and a hospital that assisted its own members. Aid was extended not only to the sick and to pilgrims of the trade who were passing through Rome but also included dowries for poor or orphaned girls, support for spinsters, help with burial, and other forms of assistance. The home and hospital were located next to the church of Sant'Angelo in Pescheria, in the Ghetto, where the fishmongers had a chapel dedicated to their patron saint, Saint Andrew. Fish flowed to the markets in abundance and at a good price, even if the largest specimens invariably ended up on the tables of the rich clergy and the nobility. Freshwater fish were the most common and the most prized, both because they were less complicated to catch and because they traveled a much shorter distance to market. Marine fish were carried along the Tiber from Ostia to the ports of Ripetta and Ripa Grande and were distributed to the city's markets from there. Fish were never as important in the regional cuisine of Lazio, nor indeed of any Italian region, as other foods. This is quite odd when one considers that Italy is almost completely surrounded by a sea full of fish, and that for centuries the Lenten fast, by forbidding consumption of meat, in effect imposed a fish diet. The problem lay in the internal transportation, where roads were almost nonexistent and travel times made it impossible to deliver fresh fish to the towns of the interior. Preserved fish had already appeared in popular cooking in antiquity. During the famous Roman Carnival, the people loved to stop at the wineshops (osterias) to eat tarantello-belly (ventresca) of tuna preserved in salt-and wash it down with a nice glass of wine. Alici, fat, tasty anchovies caught along the shore, were also preserved in salt, in large wooden barrels. Salted anchovies are used in many traditional Roman dishes. Salt cod and stockfish are found in almost all the cuisines of the Mediterranean area. The very ancient practice of preserving cod by drying or salting occurs in Roman cooking in numerous specialties. Many of the Roman meatless dishes are associated with Lent, Fridays, or any of the other 130 days of the year when, until recently, meat and its derivatives were prohibited for practicing Catholics. On Good Friday, a day of particularly strict fasting, it was usual to visit the thousand tombs of the beautiful Roman basilicas. At twilight, there wasn't a housewife whose table did not have the famous Good Friday soup, the sumptuous luccio brodettato (recipe on page 00), or the delicate pasta and broccolo romanesco in ray (skate) broth (recipe on page 00). In Rome, the feast of Saint John, on June 24, means snails (lumache), also permitted on meatless days. It falls in the season when the tasty gastropods are fat and full of flavor. After the plentiful rains of early summer, they were collected in abundance in the vineyards and gardens that, until the early 1900s, covered much of the area of today's city. The best snails are those with striped white shells, called vignarole (of the vineyards). Even today, on the night of San Giovanni, the "true" Romans gather in one of the many osterias in the neighborhood of the Basilica of Saint John Lateran to eat lumache alla romana, cooked with tomatoes and plenty of chile. As late as the 1800s, men arrived at the feast with sorghum in their buttonholes or a few cloves of garlic in their pockets and rang a cowbell, all to keep away the witches. It was also the night when the witches came to Rome on broomsticks to honor their patron, Saint John. With the first light of dawn, they went back south to Benevento and the walnut tree that, according to legend, is national headquarters for all the witches of Italy. Only the well-off could afford the luxury of sitting at a table in an osteria to eat snails; the poor, the so-called fagottari (brown baggers), took them home in big earthenware pots, covered with a cloth, and sat and ate them on the meadows around the basilica. Today snails can be found, both fresh and frozen, in supermarkets. They are sold ready to cook, but true aficionados see personally to the process of purging them, which differs slightly from region to region. In Rome, the snails were traditionally put in a wicker basket along with plenty of bran perfumed with Roman mint, and the operation took several days. On the other hand, the boom in saltwater fish in cucina romana did not begin until the 1980s: today on the tables of Roman homes and restaurants absolutely everything can be found. But the most traditional preparations are those in which the fish is combined with vegetables, such as artichokes and peas, or is used in sauce for pasta. This is the most typical Roman seafood cooking. The food of Rome and its region, Lazio, is redolent of herbs, olive oil, ricotta, lamb, and pork. It is the food of ordinary, frugal people, yet it is a very modern cuisine in that it gives pride of place to the essential flavors of its ingredients. 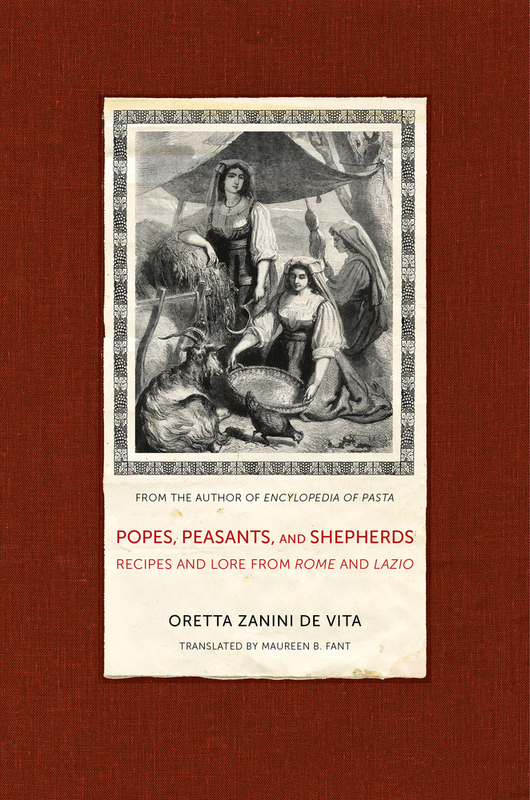 In this only English-language book to encompass the entire region, the award-winning author of Encyclopedia of Pasta, Oretta Zanini De Vita, offers a substantial and complex social history of Rome and Lazio through the story of its food. Including more than 250 authentic, easy-to-follow recipes, the author leads readers on an exhilarating journey from antiquity through the Middle Ages to the mid-twentieth century. 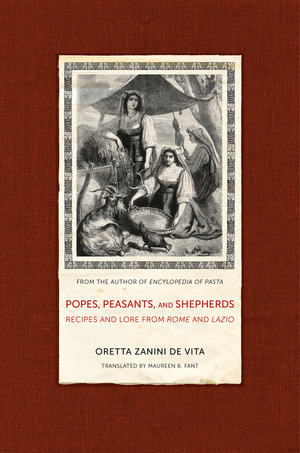 Oretta Zanini De Vita is a distinguished Italian food historian. She is the author of more than forty books on Italian food and its traditions, including Encyclopedia of Pasta (UC Press).